In a large sauté pan, heat oil over medium heat. Add beef, garlic, onion and bouillon. Cook for 5 minutes, breaking up meat with spatula. Add olives and tomato and continue to cook for 10 minutes or until beef has browned. Place 1/4 cup cheese on sliced half of brioche buns. Place buns on oven and heat for 7-10 minutes until cheese melts and starts to bubble. Remove buns from oven, spoon beef mixture on bottom half of each bun, top with top half of bun, serve with pickled jalapeños and enjoy. Omit jalapeños for a kid-friendly version. Grilled cheese sandwiches can be customized with many different ingredients. One of our favorite flavor ingredient combinations is nachos. 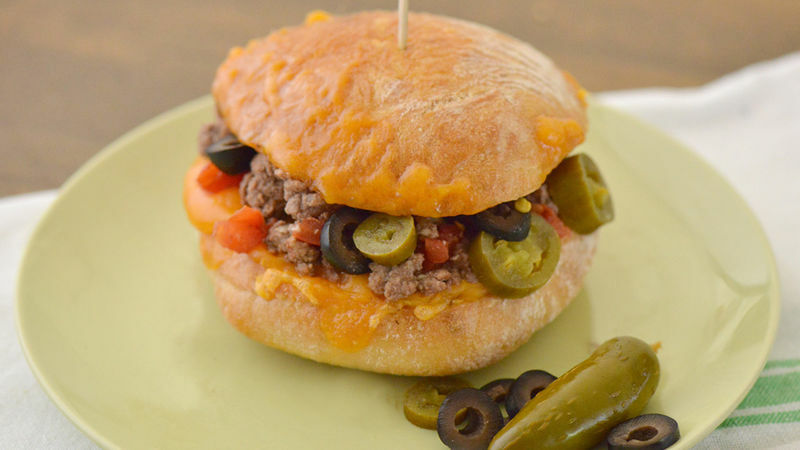 From ground beef to shredded chicken, all tasty nacho ingredients can be sandwiched together in a tasty brioche bun. Perfect for a picnic meal, box lunch, or a quick afterschool dinner, this new take on a grilled cheese sandwich will please your family and will become the most favorite quick dish of family dinnertime.